Green House Graphics #1 | At The Green House. . . The Green House is about simple things. . . the small moments that make this life so amazing. 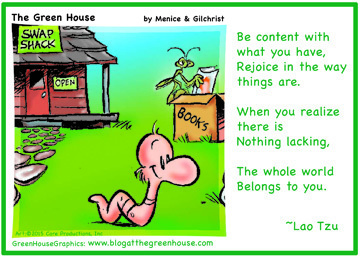 Our comic strips are quick glimpses into a simpler, yet more conscious life- but we’d like to also share our own favorite quotes as reminders of the joy of a simpler life- in one simple panel. We said we want to keep it simple. You “get it.” We’ll let you take it from here. . .